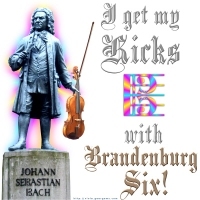 “I get my Kicks with Brandenburg Six!” proclaims this psychedelic design, depicting a statue of Johann Sebastian Bach as a violist (of course), and a colorful alto clef accompanying the text. A great gift for viola players young and old, as well as any fans of the famous Brandenburg concerti! Buy this design now on any t-shirt, hoodie, tote bag, mousepad, clock, mug or other quality apparel or giftware item exclusively from Bratsche’s Viola Bazaar!